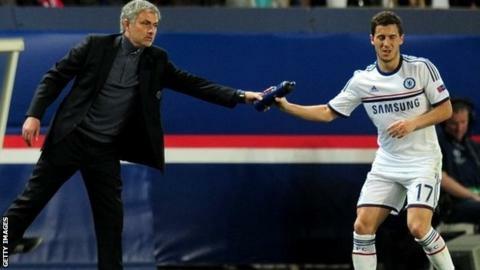 Chelsea manager Jose Mourinho has questioned midfielder Eden Hazard's commitment during matches. Mourinho suggested that the Belgian should have tracked Juanfran in the build-up to Adrian Lopez's equaliser in the by Atletico Madrid. Hazard, 23, has claimed that the Blues are only set up to counter-attack. "When the comments come from a player like Eden it's normal because he's not the kind of player to sacrifice himself for the team," said Mourinho. "He's not mentally ready to look to his left-back and leave his life for him. "Normally you get these kind of comments from players like him, from players that can't resolve a problem like we had with the first goal. "If you see Atletico's first goal, you completely understand where the mistake was and why we conceded that goal." Striker Fernando Torres had put Chelsea in front in the 36th minute, but eight minutes later Spanish forward Lopez swept in from Juanfran's cutback. The away goal gave Atletico a precious advantage, on which they built when Diego Costa and Arda Turan scored twice more for the Spanish side. In February, Hazard, recently named Professional Footballers' Association Young Player of the Year, told BBC Sport that Mourinho has turned him into a "team player". But the Chelsea manager believes Hazard can still make more progress. He added: "I'm not happy. I've tried to improve him all season." Diego Simeone's Spanish league leaders, Atletico, will play city rivals Real in the Lisbon final on 24 May, while Chelsea face their first season without a trophy since 2010-11. Mourinho says he has employed a more pragmatic playing style at times because he feared that Chelsea might drop out of the Champions League places. He said: "There are moments when you have to go for the strategic point of view if you want to have a chance to compete for what we compete. "At a certain moment, if you don't go for a bit more stability and a bit less development of a certain philosophy, it's a big risk. "I made the decision to stop that evolution in the style and philosophy of play and I went in the direction where I felt it was the only way, that, with this team and with these players, we could get results. "There was a moment that I felt this Premier League was so dangerous that was the big risk for every one of the big teams to be out of the top four."